A Bacon Cinnamon Roll Breakfast Cookie that is perfect for all of your back-to-school cravings! I have been missing that sweet and salty combo like mad. Growing up, I always thought THE ultimate sweet and salty food combination was Wendy’s french fries dipped into a creamy Frosty… or maybe vanilla ice cream topped with salted peanuts, if I was feeling a bit fancier. Then a few years back, bacon on sweets became all the rage. When the bacon on sweets craze first hit, I was a vegetarian. Obviously I was not partaking in this craze. And then when I started eating meat again, I stopped eating gluten. This inevitably kept me from trying the bacon-y sweets since they normally consisted of cupcakes and donuts. That all changed this past weekend. I decided it was time that I stopped being deprived of the bacon sweets combination. Of course there was the chance that I might not actually like bacon in my sweets. But I did not really foresee that happening since I like to consider myself one of the queens of sweet and salty. So I put crispy bacon into my giant sweet breakfast cookie. I am actually going to take a moment to pat myself on the back for this one. I think I have made a lot of good decisions in my life, and making this combination happen is most definitely one of them. Bob’s Red Mill certainly deserves some credit, too. 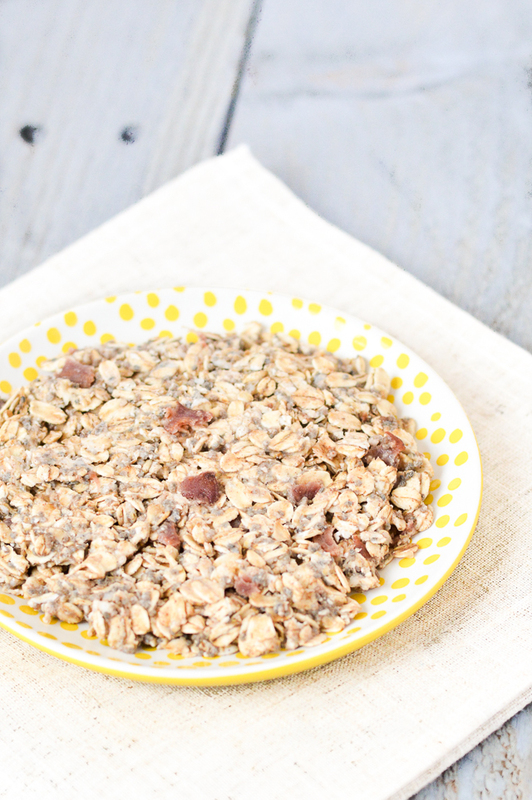 They sent me some of their gluten-free quick and rolled oats (which happen to be my favorites to use for oatmeal and overnight oats), and challenged me to whip up a sweet and savory breakfast dish perfect for back-to-school time. 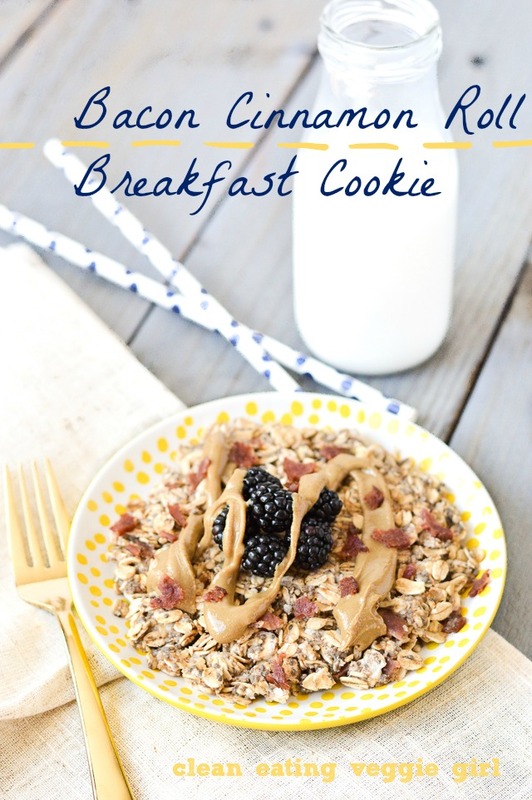 This giant cookie may not be your first initial reaction when it comes to back-to-school, but I happen to be a big fan of the breakfast cookie and how portable it can be. 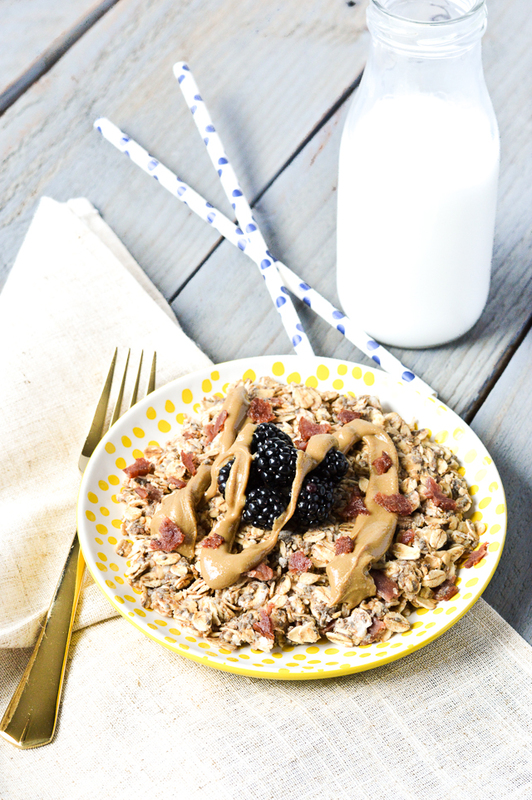 It’s actually quite perfect when eaten either before work or at my desk on a busy morning. 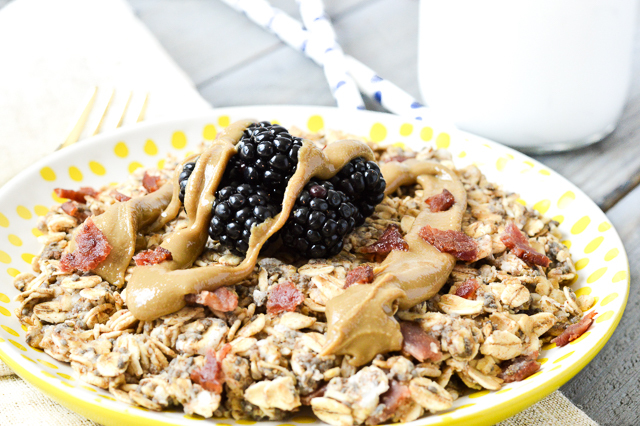 It is even better when bacon and coconut/nut butter are involved. I always prep my breakfast cookie the night before so that I can grab it and go. It does not get much simpler than dumping the ingredients into a bowl, stirring, forming the cookie, covering, and refrigerating. Trust me, people. Anyone can do this (and should)! 1. 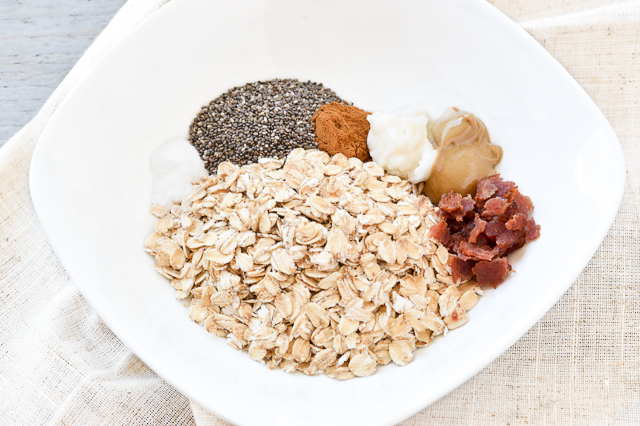 Combine dry ingredients in a small bowl: oats, chia seeds, cinnamon, sweetener, salt. Mix well. 2. 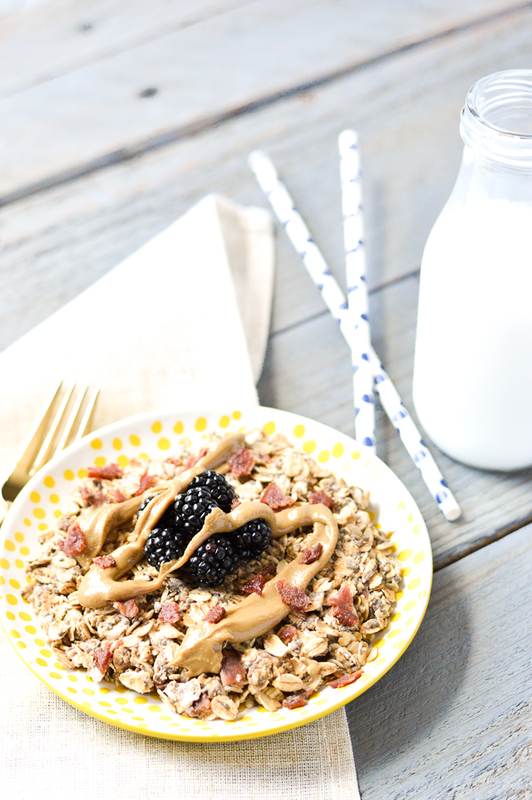 Stir in coconut butter, sunflower seed butter, and coconut milk until well-combined. 3. Gently stir in bacon crumbles. 4. Form the cookie dough into a circle, cover with plastic wrap, and refrigerate overnight (or for at least two hours). 5. 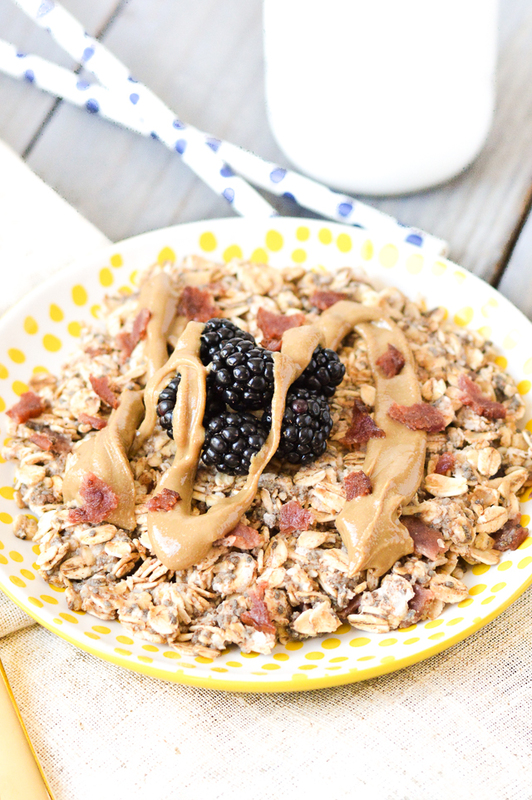 Top with additional coconut/seed/nut butter, bacon crumbles, and/or fruit. I chose berries for my cookie, but I imagine that banana slices and cacao nibs would be delicious, too! 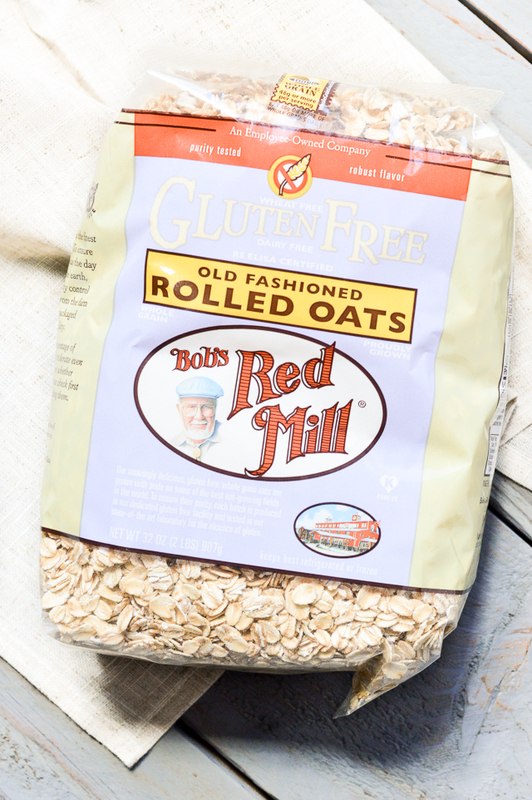 If you eat gluten-free like I do, I highly recommend cooking and baking with Bob’s Red Mill Oats because they are sourced gluten-free, packaged in a facility that is 100% gluten-free, and tested to ensure that they are, in fact, gluten-free <– all important steps for those of us who need to be GF. And since we all appreciate saving money around back-to-school time, how about a coupon from Bob’s Red Mill?! !!!!!!! We are patting you on the back as well. And shouting thank you thank you thank you. Carla recently posted...I have to versus I get to. Yay! I'm glad others love the sweet and savory combo! Sounds delicious. I need to make this! 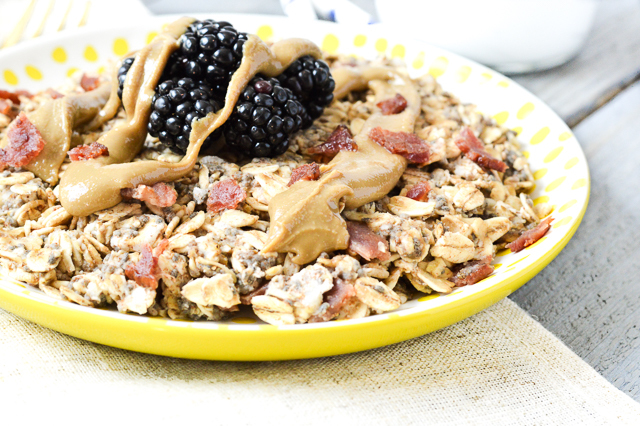 It is SUCH a good combination, especially if you love the sweet and savory combination as much as I do! 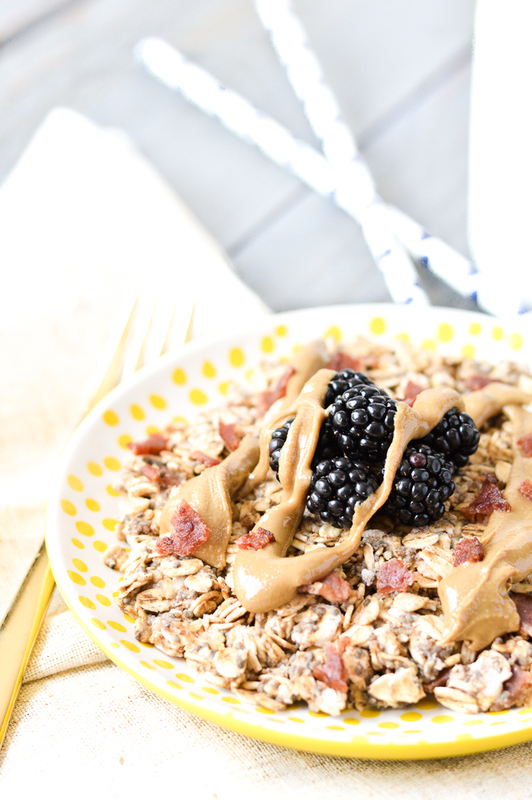 Next post: Friday Favorites + A Giveaway!